This commercial-quality blade is ideal for rip and cross-cutting two sided veneer plywood, whether finished or unfinished. It is also perfect for cutting solid woods. In fact, there is no comparable blade on the market today. The Ply Veneer Worker (PVW) uses the same high-precision technology that's behind the popular Forrest Woodworker II blade. Designed for cutting wood products only. It delivers flawless cuts without splintering or fuzz. You never have to worry about chip-outs on top or bottom surfaces. No scoring blade is needed. It lasts up to 300% longer between sharpenings. The PVW is made of super-strong C-4 micrograin carbide for extra durability. 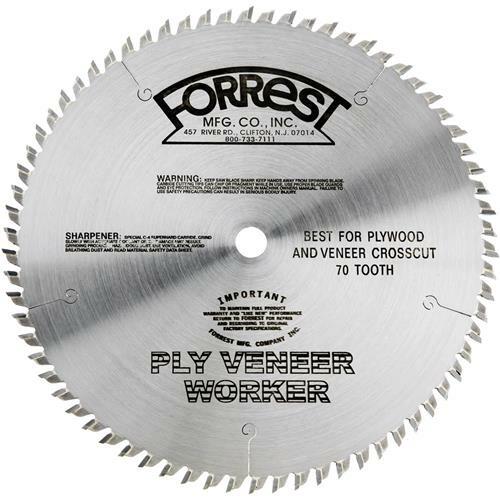 Like other Forrest saw blades, it is hand-straightened to ensure perfect flatness and has a side run-out of +/-.001. The PVW is superbly engineered. It features a 35 degree top bevel and a 10 degree positive face hook. You can count on this product to give you vibration-free performance and long life. 10" diameter, 1/8" kerf, 5/8" bore. The saw blade cuts with out tearing the plywood.